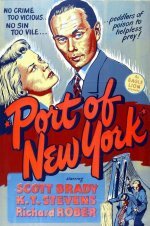 The main interest in this B-thriller is the screen debut of Yul Brynner as a New York drug trafficker whose operation is infiltrated by narcotics agents Scott Brady and Richard Rober. Brynner had hair in those days and isn't easily recognisable as the mafioso who smuggles the drugs through the New York docks. Laslo Benedek, who would later make Death of a Salesman and Brando's biker classic, The Wild One, directs in pseudo-documentary style, revelling in his locations in a film clearly influenced by previous year's thriller, The Naked City.